If we could travel back in time, we would return to 2009 with a much better understanding of the degradation of our oceans. Since time travel isn’t in the cards, having Callum Roberts act as our guide is the next best thing. In The Unnatural History of the Sea, the professor of marine conservation at the University of York in England clearly describes how we have lost much more marine life than we realize. He argues that we need the perspective of the past to inspire more aggressive action. Only then can we bring back the sea’s productivity and health. Early explorers along the European and North American coasts wrote detailed accounts of the sea life they encountered. These reports were so glowing that they might seem suspect to readers today. Yet as Roberts reviews these accounts, he provides evidence that the seas really were teeming with an amazing array of fish and marine mammals. Roberts couples these reports of initial abundance with a history of fishing over the last several hundred years. Fishers took the fish closest to their homes first, then moved further and further offshore as they depleted local stocks. New technologies, such as bottom trawling nets in the 14th century, steam trawlers in the 19th century, and advanced electronics in the 20th century, helped them chase fish more effectively. It is now nearly impossible for the fish to hide. He decries how destructive and wasteful some fishing methods are. Bottom trawling affects not just the sea-floor habitat needed by the fish harvested there, but the health of the entire ecosystem. Bycatch results in much dead or dying fish being tossed overboard. Bykill consists of fish and invertebrates that don’t reach the surface but that are killed by fishing gear nevertheless. The figures Roberts provides on species declines are startling. The cod population on the Grand Banks off the coast of Newfoundland is estimated to be less than 1 percent of what it was prior to harvesting. Oyster yields in Chesapeake Bay have dropped to 80,000 bushels per year from a peak of 15 million in the 19th century. He estimates that the total mass of fish in European seas today is 5 percent of what it was before industrial fishing began. After all this, Roberts turns out to be optimistic about the future of the sea. “The creation of national and international networks of marine protected areas, together with some simple reforms in the way we fish, could reverse this run of misfortune,” he states. “We cannot return the oceans to some primordial condition absent of human influence. But it is in everyone’s interest to recover some of the lost abundance of creatures in the sea." In stark contrast to terrestrial preserves, which make up 12 percent of the total landmass, only 0.6 percent of the sea is at least partially protected from fishing, according to Roberts. He makes a strong case for designating far greater sections of the sea as preserves. This would allow fish habitat to recover and let fish live longer, reaching ages favoring greater reproductive success. Roberts writes that spillover fish from protected areas would resupply fishing grounds, so there would actually be more fish available to harvest, not less. He also offers recommendations on management policies to make fisheries more sustainable. Callum Roberts’s writing is quite engaging and his proposals are compelling. 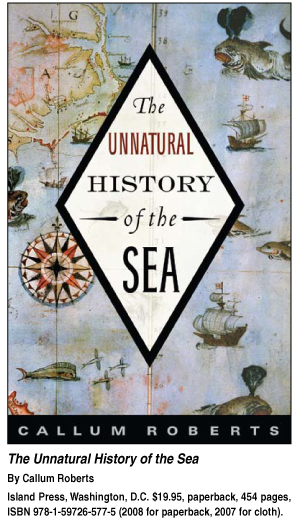 With The Unnatural History of the Sea newly available in paperback, his call to action can deservedly reach a larger audience. This book begins with a timeline from 2007 through 2008 that traces natural and man-made environmental disasters, chronicles changes in oceans and the efforts to protect endangered species, while illustrating the connection between earth’s inhabitants and the changes that affect them. 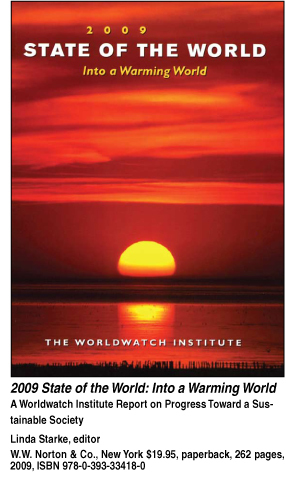 The 2009 State of the World by the Worldwatch Institute is a collaborative work, the 26th consecutive book in a series by the organization, building on and crediting the groundbreaking climate change work by Goddard Institute scientist James Hansen more than 20 years ago. With dozens of contributors from around the globe, the book covers everything from the role of cities in climate change, through India’s fledgling efforts to stem the progress of climate change and building resistance to drought in Sudan. “The science of climate change has come a long way” say the three project directors - Robert Engelman, Janet L. Sawin and Michael Renner - at the book’s start. From farming to the security challenges climate change will present as populations grow hungrier and poorer, the data in the book is diverse, but most of the authors point out the worldwide connections. Despite the book’s far-flung perspectives, it provides useful information for everyone concerned about the effects of global warming. Thomas Lovejoy, president of the H. John Heinz III Center for Science, Economics and the Environment in Washington, D.C., writes a chapter on Climate Change’s Pressures on Biodiversity. He shows changes in the behavior of species, for example, eel grass and the yearly northward movement of its southern limit in Chesapeake Bay. These species need an “equilibrium... The colder and more acid the water is, the harder it is for organisms to mobilize calcium carbonate,” including coral and giant clams. Lovejoy and other authors, despite documenting negative effects on the world and its people, also offer hope for progress, mitigation and adaptation, if not total respite. There’s optimism along with the dire news, but authors agree optimism will last only if there’s action, because urgency is needed. “Though rarely recalled today (in the late ‘80s) the Montreal Protocol offers lessons for the climate negotiations of 2009” when the U.S. government and chemical manufacturers supported the phaseout of ozone-depleting gases.